STOPPING THE FLOPPING ~ Roundball Manor - The House that Basketball Built. The game of basketball has been going through changes, adapting to trends and adopting new styles of play since its inception by Dr. Naismith. Things like the introduction of the three-point line; crack and coke being the preferred fuel during the ABA/NBA days, and hand-checking being outlawed. There are a myriad of things that have affected the game - some good, some bad. Currently, the bad trend afflicting The Association is known affectionately as “flopping”. In other words, players blatantly (and fraudulently) overselling contact to draw a foul. It is getting out of control and leaves a bad taste in everyone's collective mouths. It seems to have been born from the globalization of the game - specifically the influx of European players. In Europe, the sport everyone plays while growing up is soccer. When thinking about soccer think of soccer, two things come to mind: First: It is the most boring sport to watch overall. Running up and down a field for 90 minutes to end in a 0-0 tie is the equivalent of when Eric Snow was an Analyst on NBA Gametime. In other words, it is time for a nap. The other thing that directly comes to mind regarding soccer is the flopping. It is horrendous to watch. Seeing two players stand near each other and one just randomly falls down in agony makes me sick. Google "worst soccer flops" and prepare to be horrified. Nobody agrees with it, but it has worked its way into the fibers of the NBA culture. "Money. Money is always the [thing]. People say public scorn, the humiliation. Guys could care less if they're publicly humiliated. If they want to put an opera of all my charges on there or flops or whatever, go for it. You take $10 from me, and I'm upset. Money. No one cares. In our society now, labels don't matter. They change every 10 minutes, so who cares? But money -- that hurts." 1: Consistency. In a given season, your first flop's fine is X amount of dollars. The next flop increases the dollar value, and it continues going upward from there. Note: I am not qualified to determine what the dollar value of the fines should be. I don't make millions and millions of dollars, so I can't make an educated statement on what amount hurts and what doesn't. All I know is if you want flopping to stop, make it count. At first it should sting, next time it should burn. From there, if the lesson still isn’t learned, the pain should start to hurt and ache, eventually leading to crippling. Escalation is key here. 2: Proportion: Say you have two players, Kobe Bryant and a random 5th year player. Kobe makes the league maximum, making his 2012-2013 salary $27,849,149. The random 5th year player makes the 2012-2013 league minimum of $992,680. If we use the examples from Game 4 between the Heat/Pacers where all offenders (James, West, and Stephenson) received a $5,000 fine, there is a disconnect. Apply that logic to the scenario mentioned above, and do you really think Kobe is going to sweat a flopping fine of that amount? (For the record, Kobe would NEVER flop because his psycho competitiveness would never allow/concede to being bettered by another). Now let's compare how the 5th year player would feel. I think that five grand hurts just a tad bit more because it is all relative. The point is, make the fines proportionate to the offending player's salary. Regardless of what a player earns, the first flop fine is X amount dollars because it is based off of a pre-determined percentage, regardless of your pay. Obviously, the percentage increases with each instance, stating in-line with the previous point. This way, everyone hurts the same. 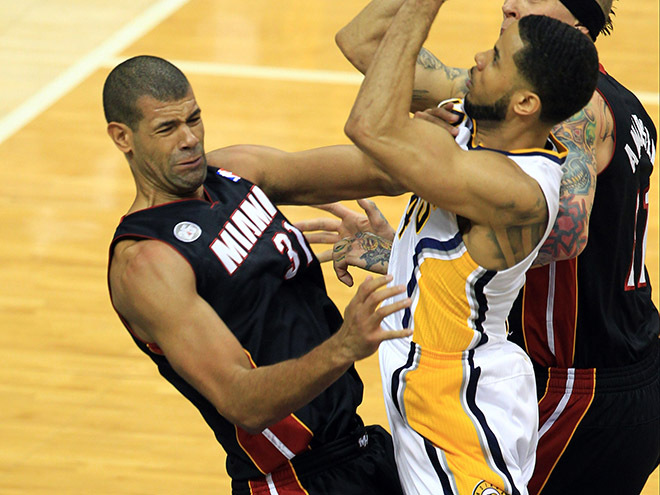 3: Team Dynamic: Battier's statements clearly apply to the majority of the players in the league, no doubt. However, there are exceptions to every rule. Some players just may not care because they have so much money (let's not forget sponsorship money aside from salaries). I also wouldn’t rule out the possibility that some teams condone this behavior and might possibly pay the fine for the offending player. If the NFL’s Saints can have bounties, this is totally within the realm of possibility. What's that old phrase? "If you ain't cheatin', you ain't tryin'"? So, to go along with the escalating fines proportionate to a player's salary, institute a Three-Strike Policy. Everyone knows what this means, and it is a generally-accepted policy in all kinds of scenarios in the world - not just sports. After your third flopping instance, you get suspended for the amount of games equivalent to however many personal fouls you have at that point in the game. If your third flopping instance occurs while you have four fouls, you just got suspended for four games. This makes sense because where flopping matters most is towards the end of games where each possession means that much more. So, if a player dares to flop in a late-game situation (which is also the time he is likely to have a higher number of personal fouls assessed to him), the stakes and risk are that much higher. This measure handles the players where money isn't a problem. Oh, the fines don't hurt your wallet? Well, how does it feel to hurt your team? Also, regardless if a player eclipses three or more flopping instances, the fines still keep escalating. For those who don't know, the money collected from NBA fines goes to charities. This is a good thing. In the New World, Flopping will get you tarred and feathered in the town square. Flopping has to stop. It is completely sullying the reputation of the game. I would love to be inside the heads of players like Barkley, Jordan, and members of the Bad Boys when they see flopping occur. They must be offended and be thinking offensive things. Tradition and history in the league is a hugely respected part of the NBA. Basketball is a physically-demanding game played by muscle-bound athletes in fantastic shape who shouldn’t be flying around like bullied children. Don’t let the game be turned into soccer's ugly brother Mr. Stern/Mr. Silver. Institute The Flop Stop and let's get back to playing this game we all know and love the right way.